Ok, so I thought I was totally in love with the Thai green curry shrimp I shared with you all last week. Then, I met this coconut curry chicken. Seriously, this is the recipe you need to plan to make right away. And, if you are on Whole30, this is the recipe that will make you absolutely FORGET you are on Whole30. (I even have neighbors who say so!) It is that good, promise! I am not sure words can really describe how much flavor is packed into this dish. Don’t be fooled by the list of ingredients. This recipe is on your table in 30 minutes (or less) which is a HUGE bonus too. I serve it over cauliflower rice but, of course, you can do regular rice if you prefer. 1. In a large bowl, combine 1/2 tsp salt, 1/4 tsp ground pepper, 1/8 tsp cayenne pepper and 1/4 cup lemon juice. Add chicken pieces and toss to combine. Marinate for 10 minutes. Remove chicken and discard marinade. 2. In a large skillet, heat 1 Tbsp coconut oil over medium heat. Add chicken pieces and cook for 5 minutes or until no longer pink (they do not need to be fully cooked). Transfer to plate. 3. Heat remaining coconut oil in skillet. Add onion and cook for 2-3 minutes. Add garlic and ginger. Cook for 1 minute. Stir in turmeric, coriander and curry powder. Cook for an additional minute or until fragrant. 4. Stir in tomatoes, with juices, coconut milk and chicken. Bring to a boil and then reduce heat to simmer. Simmer for 10 minutes or until chicken is fully cooked. Remove from heat and stir in 2 Tbsp lemon juice and 1/8 tsp cayenne pepper. In a large bowl, combine 1/2 tsp salt, 1/4 tsp ground pepper, 1/8 tsp cayenne pepper and 1/4 cup lemon juice. Add chicken pieces and toss to combine. Marinate for 10 minutes. Remove chicken and discard marinade. In a large skillet, heat 1 Tbsp coconut oil over medium heat. Add chicken pieces and cook for 5 minutes or until no longer pink (they do not need to be fully cooked). Transfer to plate. Heat remaining coconut oil in skillet. Add onion and cook for 2-3 minutes. Add garlic and ginger. Cook for 1 minute. Stir in turmeric, coriander and curry powder. Cook for an additional minute or until fragrant. 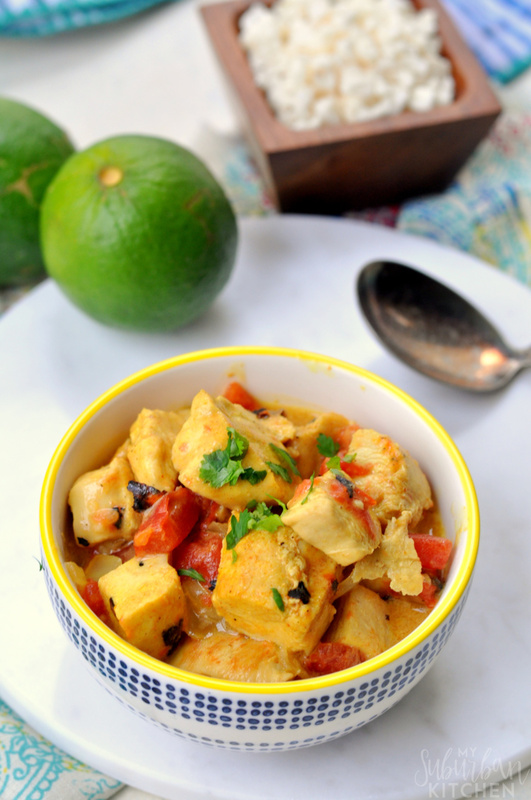 Stir in tomatoes, with juices, coconut milk and chicken. Bring to a boil and then reduce heat to simmer. Simmer for 10 minutes or until chicken is fully cooked. Remove from heat and stir in 2 Tbsp lemon juice and 1/8 tsp cayenne pepper. See all the steps to make this amazing dish in the video below! This looks and sounds so good! Thanks for sharing on the What’s for Dinner link up! This looks amazing – I can almost smell it just looking at it! 🙂 Pinning to make next week! Yum! This recipe looks mouth-watering good! I love a good curry. Pinned and sharing. Thank you for joining us at Family Joy Blog Link-Up Party. I hope you will join our next party starting Sunday at noon EST. 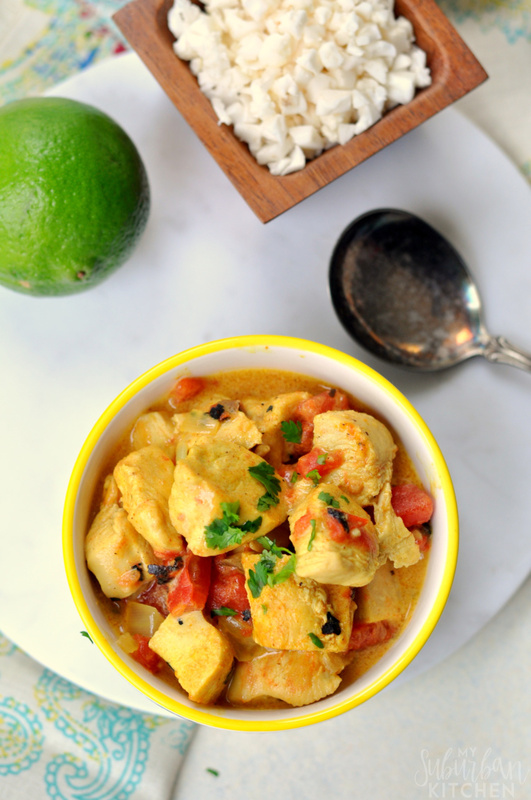 This is a chicken curry I would gladly eat…no matter what diet I’m on! This looks delish! Thanks for sharing on Funtastic Friday! 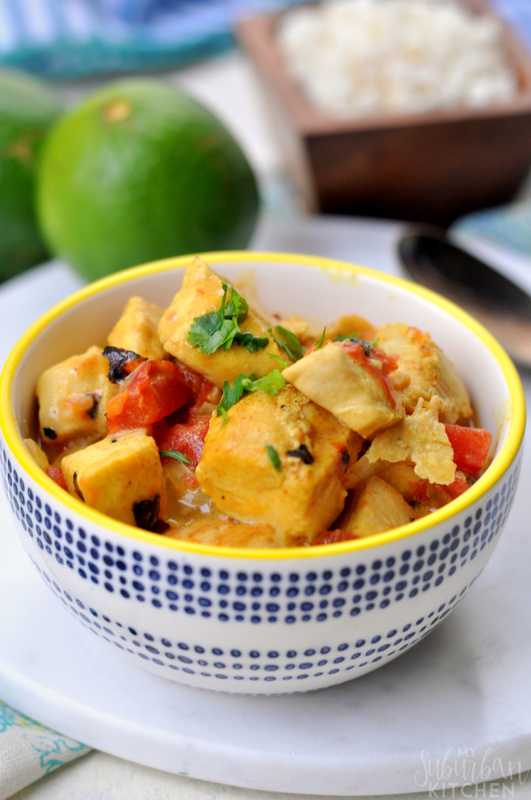 Your Coconutu Curry Chicken looks fabulous! Hope you are enjoying your day and thanks so much for sharing your awesome post with us at Full Plate Thursday! Looks yummy! Thanks for sharing at the Inspiration Spotlight party. Pinned & Shared. This recipe looks delicious and simple! Featuring this week on Family Fun Friday, thanks for linking up! I’ve had a can of coconut milk in my pantry for awhile now and need to use it. This sounds awesome! Grab that can and get cooking! We actually had this again last night and everyone still loved it. 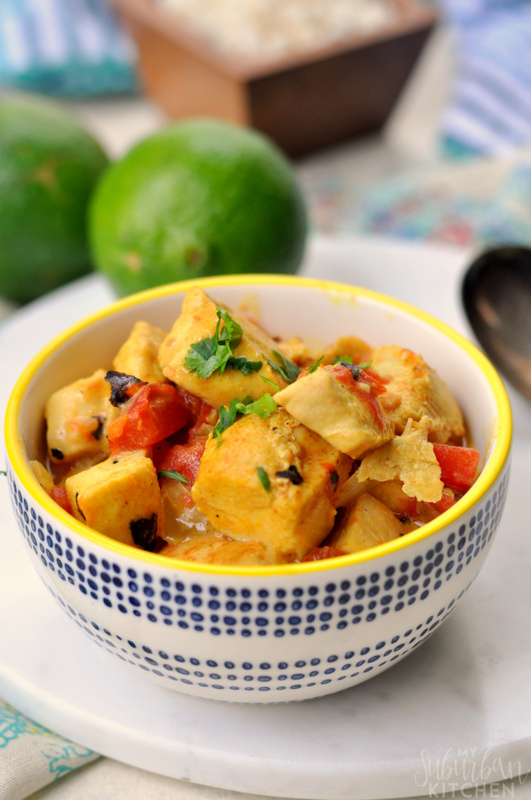 I love the coconut and curry combination in this! So full of flavor!